The most popular feature request we’ve had in the last year has been for the ability to preview an import and map the columns when importing users into a List. Well the wait is over and our latest update provides a simple to use field mapping feature that will help you and your clients import data onto lists in a faster and more efficient way. There is a new option to preview the file before you import. 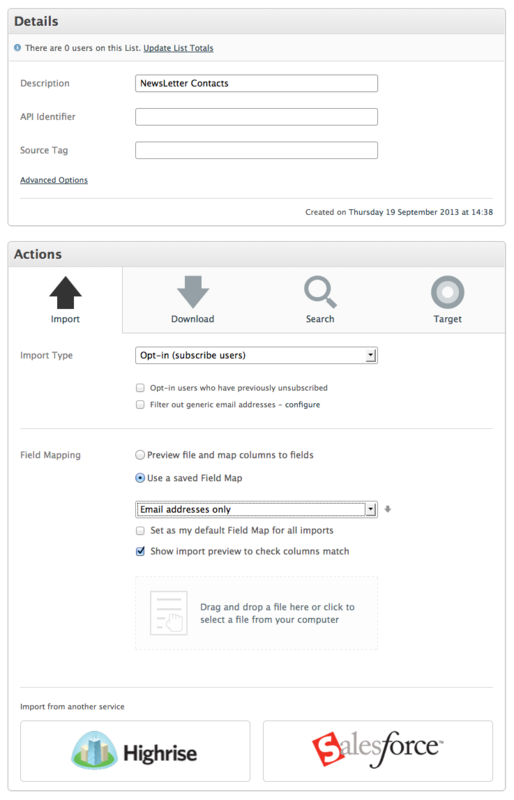 This enables you to map the fields yourself and save your selections for use again later. We’ve added field validation into the new feature to identify invalid records before your import takes place, helping to reduce errors. Using saved Field Maps is still available and we’ve done our best to keep the import process as near to what it was previously. 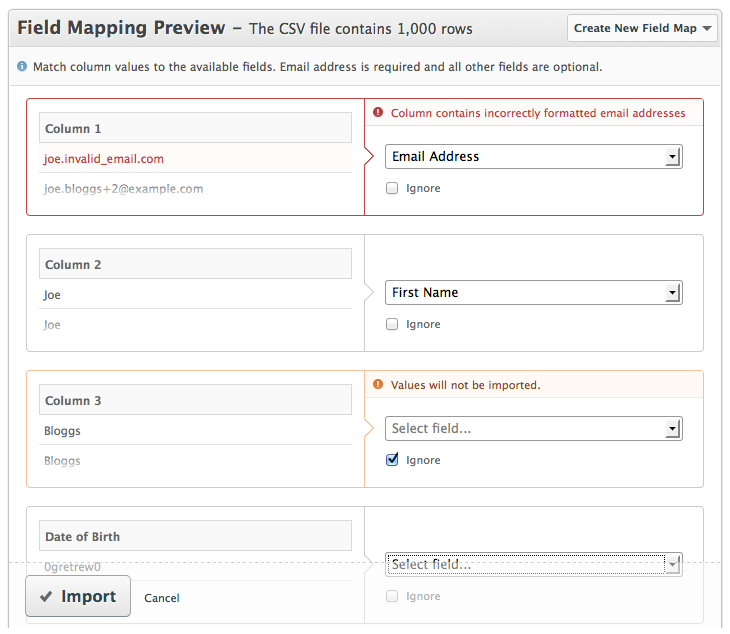 Next time you import to a List, use the Field Mapping Preview, we’d love to know what you think. If you already use one of these CRMs to track customers and deals then our new import integrations will make the process of adding users into your email solution much simpler. The option to import from either CRM is available when you create a new List or edit an existing List. If you use Highrise Tags you are able to filter contacts so only a subset of your contacts are imported. View the Highrise Tag support article for more information. In case you didn’t already know, we track each time a List has been used and we record the delivery and performance metrics. There is now a view of delivery performance and Feedback Loop complaint analysis. The List edit screen now has a new look including a new drag and drop file uploader. Go to the List edit or create a new List page and take a look at the new features that are available. 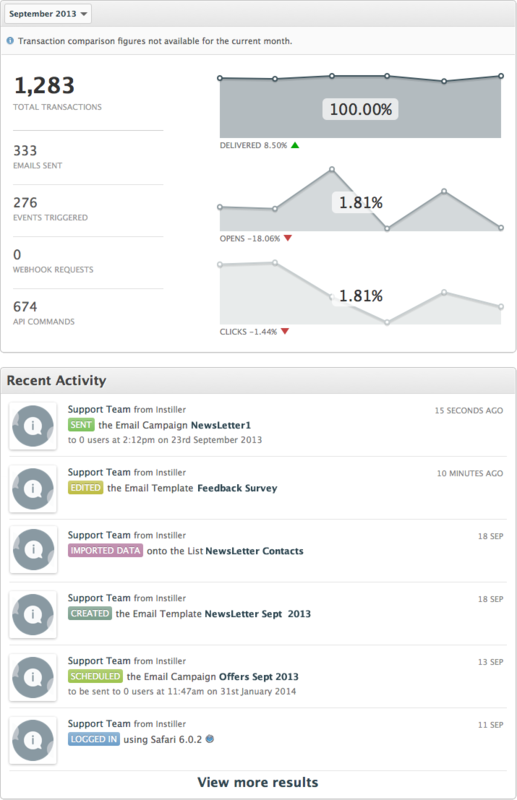 The Agency dashboard has been revised to provide a better view of what is happening in your solution. There is a new Recent Activity feed to help you monitor what clients are doing and provides direct links into the items they’re working on. The activity feed can also help to track down any support issues your clients may be experiencing. We have always had a number of solution level reports, if you have not used them before log into your email solution and from the Agency Tab select a Solution Report from the right sidebar . If you have any suggestions of how we can improve the reports please do let us know. We’re in the process of improving our Targeting section. If there are any suggestions for this feature please do let us know by raising a Support ticket or by adding a post in our forum. We’ll keep you updated on this exciting new development.